Bed bugs are extremely mobile and can travel quickly from room to room or home to home, by hiding in luggage, clothing, furniture, boxes, bedding, and other items. Here are 5 key facts about bed bugs that expose the impact these creatures have on public health in the United States, and the challenges that remain in treating and eradicating them. An article in Time magazine cited a study that showed bed bug infestations were higher during the warmer seasons. Bed bugs are more prone to reproduction and circulation during these hotter months. This study and knowledge about infestation patterns will help us find effective ways to get rid of bed bugs. Other top places where bed bugs are encountered are listed in this Travel Channel article. An increase in frequency and proximity of travel may also be part of the reason for more bed bug infestations. According to the National Pest Management Association (NPMA), a 2015 Bugs Without Borders Survey conducted by the University of Kentucky showed 68 percent of people stated that bed bugs are the hardest pest to defeat. If you’re dealing with a shared space, and can everyone be part of the treatment plan? Because of their small size, life cycle changes, behavior, ability to hide, and fast reproduction rate, bed bugs can easily go undetected. Plus, they usually feed when people are sleeping. Over time, many bed bugs in different regions have become immunity or resistance to some treatment options available for getting rid of the tiny critters. Scientists have tested foggers and other products and found some to be ineffective. This presents a challenge in getting rid of bed bugs, as many treatment methods may need to be used in conjunction with one another and the multi-layer treatment process can take longer. Bed bugs (Cimex lectularius) are small, brown, and flat-bodied bugs that feed on human or animal blood. They are about the size of an apple seed and after they eat, their bodies turn more bloated and red in color. These small bugs can move quickly by crawling. Though they do have wings, they are not used for flying. Their bodies include a beak and 3 parts, an antenna with 4 parts, wings, and short hairs. Bed bugs also have an odor that is made by glands on their bodies that smells musty and sweet. Where do bed bugs live and come from? Bed bugs primarily live where their hosts (people or animals) live and spend a lot of time — in mattresses, bed frames, headboards, box springs, and bedding. They like to stay in small spaces in groups and hide in spots where they can easily feed. Many times, bed bugs enter homes or places by traveling on luggage, clothing, boxes, used furniture, and couches, among others. They can also travel from apartment to apartment, home to home, and room to room. These insects live all over the world, and date back to ancient times. 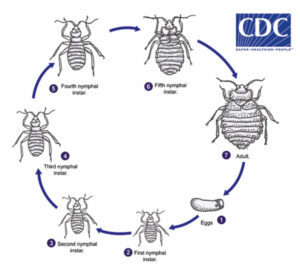 Bed bugs start as eggs that are about 1/16 inch long and grow into 5 nymph stages before they become an adult (male or female). Females lay about five eggs — in mattresses, box springs, etc., — during the adult life cycle. Once eggs are laid, they hatch between 4-12 days later. This first nymph stage means the bed bugs are ready to have their first meal. After the first meal, the bed bugs will molt into the next nymph phase. This process repeats for each nymph phase. It takes about 5-10 minutes for bed bugs to eat a whole meal. Adult bed bugs usually live to be 6 months to a year old. They can survive for a long time without getting a meal (up to and sometimes more than a year), which is one reason they are such good travelers. Prevention is key! Bed bug treatment can be a challenge that interrupts daily life. Bed bug treatment also is expensive, especially if you have to pay for a professional service, supplies, and if you’re forced to replace your mattresses, bedding, furniture, accessories, and other large investments. Bed bugs are small and they are excellent at hiding, so knowing how to detect them is important. The Environmental Protection Agency suggests that an infestation should be addressed immediately, no matter how big or small. Other bugs and insect bites can be mistaken for bed bug bites or bugs, so it is recommended that you accurately identify the bugs and take action quickly. Bed bugs are usually somewhere about 15 to 20 feet from where you sleep. Using a flashlight will help illuminate the small spaces and cracks where the bugs can easily hide. Since bed bugs are great travelers and can go long periods without eating, they can come into your home easily undetected. Follow these tips on preventing bed bugs from getting into your home. Protecting your home and yourself means taking precautions when you are outside of your home traveling, and spending time in community gathering places. Bed bugs can hitchhike into schools from infested homes of students, teachers, and school staff members. Teachers and school administrators and staff members should know the proper procedures in dealing with bed bugs. Here are some tips on what to do if a student or person has been identified with bed bugs. Do you have bed bugs? If your answer is yes: first thing’s first — don’t panic. We will walk you through tips and steps to help you determine the best course of action. There are steps you can take right away to start addressing a bed bug infestation. Consider these tips on getting started and how to prepare for treatment. You can attempt to exterminate bed bugs yourself. However, it is highly recommended that you do it in the most effective, safe, and legal way possible. If you’re considering a DIY method, make sure you follow the initial starting steps above in preparing for treatment. If not, treatment may not be as effective. Step 2: Attempt bed bug removal with non-chemical methods like heat or cold treatment and remove bugs from area and items with vacuum, cleaning, etc. Note: The EPA has a list of approved products available online. Illegal and unsafe or non-EPA approved methods are listed here. Also, check state pesticide laws through the National Pesticide Information Center and bed bug laws and regulations through the Environmental Protection Agency. Where do I find help to deal with bed bugs? There are some local resources, including your county extension office and state regulatory departments, that will be helpful in your bed bug identification and assistance. How do I hire a professional? Although do-it-yourself methods can be effective, the most successful treatments are done by pest management professionals. Make sure you understand the contract, costs, etc. Does your service offer a canine investigation, too? Bed bug extermination can cost anywhere from $500 to $5,000. In general, it can cost $250 to $900 per room. Professionals will inspect the site and charge a fee for the inspection, and charge for services that day, along with follow up treatments and visits. If you request services from a trained dog, those usually run from $300 to $600 per home. Bed bugs are small, brown, and flat-bodied bugs with a beak. They feed on animal and human blood. When they feed, their bodies become bigger and more red in color. Bed bugs do have wings, but do not fly. Bed bug bites are caused by bed bugs piercing skin and feeding on blood with their beaks. The bites are usually not painful immediately, but later turn red, itchy, and look like welts. Bites are typically found on skin that has been exposed during sleep. They don’t have red spots in the center. Anyone can get bed bugs. Bed bugs probably traveled to your home by hiding in a suitcase, piece of furniture, moving box, or article of clothing, or traveled by way of a shared hallway or community laundry facility. Or, a visitor who was affected by bed bugs was in your home and brought the small creatures over. Scratching from the bites can cause infections and an infestation can also lead to loss of sleep, insomnia, depression, and anxiety. Each person reacts differently — from a small itchy bite to an allergic reaction. In the case of an allergic issue, a person may need to consult a medical expert. You can approach your bed bug infestation with do-it-yourself methods or hire a professional. No, they are not known to spread disease. What are some myths about bed bugs and are they true? Bed bugs can bite pets but don’t live on them. Bed bugs can travel on your pets in fur and bedding. If you find bed bugs on your pet or their bed or clothing, wash all items in hot water and use a hot dryer, and investigate your infestation further. Ensure all treatment methods will not affect your pets and if using a professional service, notify the pest management specialist that you do have pets in the home. Learn all about bed bugs from WebMD and more in this photo slideshow. Look at this interesting infographic by Mother Nature Network on bed bugs. Read about bed bugs and how to get them out and keep them out from the Environmental Protection Agency. The National Pesticide Information Center has a lot of information about bed bugs on its website, plus other resources. Find an FAQ and more information about bed bugs through the Center for Disease Control. Learn how to find bed bugs from the Environmental Protection Agency. Cornell University offers information on their website about how to find out if you have bed bugs and how to perform an inspection. Learn about bed bugs and how to find them from the Center for Disease Control. Read more about what to look out for with bed bugs in this self.com article. Learn some tips for how to check a hotel room for bed bugs in this USA Today article. Read tips on how to inspect your hotel room for bed bugs by the University of Minnesota. Check out the Bed Bug Registry and find out where bed bug infestations have been reported in hotels and lodging places around the country. Bed Bug Reports is another resource for researching which hotels (by state) have had cases of bed bugs. Learn 15 tips for avoiding hotel bed bugs in this health.com article. 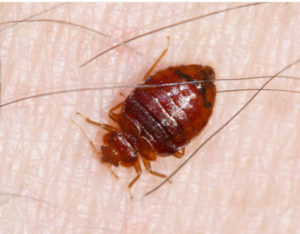 Read about the best way to search a hotel room for bed bugs in this Fox News article. The Georgia Department of Public Health’s handbook on bed bugs talk about hotels and bed bugs on page 10. Johns Hopkins Hospital published a manual about procedures for dealing with bed bugs in the hospital environment. Read this article by The Society for Healthcare Epidemiology of America and The University of Chicago Press about bed bugs in health care settings. Consider this NPR article about bed bugs in hospitals and nursing homes. Read this information from the National Pest Management Association on how to respond to bed bugs in medical facilities. The Georgia Department of Public Health’s bed bug handbook covers bed bugs in hospitals on page 11. Read about what landlords need to know about bed bugs and dealing with tenants from the Environmental Protection Agency. Find out about bed bug laws by state from the National Conference of State Legislatures. NOLO.com’s website has a section about landlord responsibility for bed bugs and how to handle a bed bug infestation in rental units. Learn about tenant’s rights when it comes to bed bugs and the law from the Legal Services of New Jersey. Read questions and answers for tenants on bed bugs from Iowa Legal Aid. Read the University of Minnesota’s guidelines for dealing with bed bugs in schools. The Environmental Protection Agency published this guide to bed bugs in schools that addresses steps to take, communication with parents, and information on bed bugs. Consider this fact sheet from the Michigan Department of Education, Michigan Department of Community Health, and the Michigan Department of Agriculture, on what schools need to know about bed bugs. The New York Department of Education created a bed bug information kit just for schools. Read the Environmental Protection Agency’s guide to dealing with bed bugs in child care facilities. Here is a helpful fact sheet from the Safer Pest Control Project on bed bugs in schools and child care facilities. The Georgia Department of Public Health published a handbook on bed bugs and addresses bed bugs in shelters on page 11. Read this bed bug action guide for shelters by Virginia Tech’s Department of Entomology. Learn more about dealing with bed bugs in transitional housing from the Michigan State University Extension. Texas A&M Agrilife Extension published this guide about bed bugs in homeless shelters. Read about suggestions from the Alameda County Vector Control on controlling and preventing bed bugs in group living environments. The National Pesticide Information Center website provides a list of resources on tools for pest identification for detection. Read this National Geographic article about an effective do-it-yourself trap for monitoring bed bugs in the early infestation stage. Find out how to to look for and detect bed bugs from the Environmental Protection Agency. Here’s a guide from the University of Minnesota and the Minnesota Department of Health on how to detect and control bed bugs in lodging establishments. Consider more information on detecting bed bugs with bed bug monitors from the Rutgers New Jersey Agricultural Experiment Station. Check out this easy-to-read slideshow from Real Simple with quick tips on bed bug prevention. Learn more about prevention and control of bed bugs in your home from the University of Minnesota. Read the Environmental Protection Agency’s top 10 tips for controlling bed bugs and prevention and more prevention tips for public places. The University of California Agriculture and Natural Resources lists helpful information about how to manage pests in homes, structures, people, and pets. Learn about bed bug prevention and infestations from the National Pesticide Information Center. Read our guide on How to Clean a Mattress. Read more about non-chemical bed bug extermination methods in this guide by Virginia Tech’s Department of Entomology. The Environmental Protection Agency’s website lists extermination methods and varieties of pesticides that are EPA-approved. Plus, consider this EPA pesticide product search tool. Learn more about tackling bed bugs and extermination from this starter guide from the Environmental Protection Agency and Evans School of Public Policy and Governance. Read more about hiring a professional for pesticide extermination and consider this guide from the University of Minnesota. Look over this checklist before preparing for do-it-yourself bed bug treatment by Michigan State University, Michigan Department of Health and Human Services. Consult this list to find out more about why bed bug treatments don’t work from the Environmental Protection Agency. Here’s a helpful resource on do-it-yourself bed bug control options on the Texas A&M University website. Watch a video on how to get rid of bed bugs by The Home Depot. Here’s a video on bed bug control and prevention by Purdue University Extension. The New York City Department of Health published a helpful guide on preventing and getting rid of bed bugs safely. The guide is geared toward property owners, managers, and tenants. Read this guide on dealing with bed bugs by hand and do-it-yourself methods from the University of Minnesota. The Michigan Department of Health and Human Services and Michigan State University published a guide on getting the bed bugs out with tips on how to decide on a treatment plan. Before you hire a pest control professional, consider these tips from the University of California Agriculture and Natural Resources. This page also includes tips on what to do after hiring a company, too. Learn more about pest control professionals from the National Pesticide Information Center. This guide on how to select a bed bug provider from the Texas A&M Agrilife Extension talks about what to look for in a bed bug pest control provider, tips on preparation, and bagging. It also includes a sheet to use when interviewing pest professionals and companies. Read about hiring a professional and key questions to ask from the University of Minnesota. Learn tips on what NOT to do when you have bed bugs from the University of Minnesota. Read 201 things to know about bed bugs from the American Camp Association that appeared in Camping magazine and more about what every camper needs to know. Consider more research about the bed bug epidemic in the United States in a paper from the University of Arkansas. The National Pesticide Information Center’s website has information and resources on state regulations and other pesticide regulations and federal agencies.